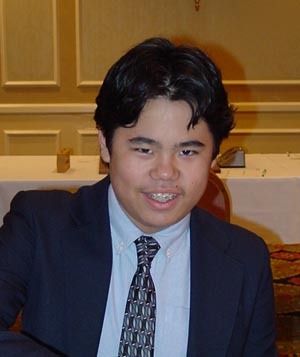 Hikaru broke all American records when he became the youngest player ever to reach master status at 10 years and 2 months old. Since then it has been steady improvement for the young phenom and let�s not forget that he is still just 14 years old. He received his first GM norm a half a year ago in Bermuda and you can be assured the rest are soon to come. In the NY Master Action expect big things from Hikaru as he is an extremely skilled speed player. Not many players in the country would have an easy time of it against Hikaru in 2 minute chess as in this form of chess I literally have never seen him flag. In his first ever NY Masters he tore through the event with a 4-0 score, beating GM Stripunsky and IM Ippolito along the way. His extreme competitiveness and fierce desire to win makes him very difficult to beat and he will do whatever it takes to bring home the point. On the Internet Chess Club he is one of the best, if not the best, 1 minute players around. As for his openings he seems to be shifting his openings towards d4 these days and has been favoring the Grunfeld and the Najdorf Defense recently. Hikaru won the US Championship in 2005. As of October 2004, Hikaru is ranked number 8 in the USA, and 83 in the World.